One of the outstanding young point guards in the 2020 class hails out of Indianapolis, Indiana, and brings a lot of passion and competitiveness to the position. That player is Indiana native Michael Saunders (Wasatch Academy in Utah) who also competes on the circuit with G3 Grind and led his AAU team through some impressive runs this summer in a couple big events. While the entire team would get after it and play with a lot of energy, Saunders was certainly the engine driving the team forward behind his infectious effort and talent. Saunders is roughly 5’10” tall with excellent handles, great quickness, a nose for scoring the basketball in a variety of ways, and a mentality to go make the big play when a big play is needed. The poised point guard affirmed his playing qualities saying “my strengths are getting to the rim whenever I want and finishing different ways, and also getting my teammates open.” His passing and ability to involve his teammate is probably an underrated aspect of Saunders’ game, but he does a nice job of making the right play or right pass when the defense tries to clamp down on him. Saunders has a really nice pull-up jump shot and has a great feel for when to pull up or when to blow by his defender and get to the rack for the finish. His instincts are outstanding and he has a great feel offensively for making plays. Those talents are a big reason why he was able to lead his team to some big wins over the spring and summer. 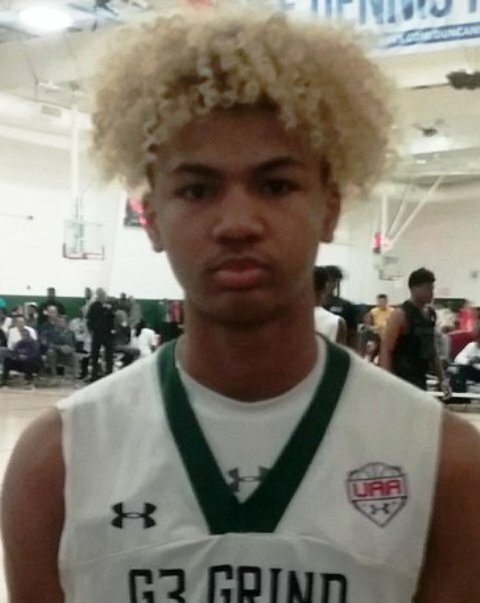 “My favorite highlight was when my team won the 16U UAA event… It was a big accomplishment for us because we worked so hard for it and we knew that we were the best team, so winning it just stamped it for us.” Saunders made some big plays throughout the event and earned some high praise and honors for his role in the team’s accomplishment. “Making UAA First Team was big for me too, because that showed how hard work pays off for me,” Saunders commented about his individual achievement as well. Saunders and G3 Grind also came up a win shy of another tournament win, making a huge run at the NY2LA Sports Summer Jam, taking the runner up spot behind an impressive tourney run, during which Saunders left his stamp on a number of wins there as well. That included a sweet turn-around fall away jumper in the closing seconds of one game to tie it up before a teammate buried a couple free throws to win it and advance. Saunders skills have certainly shown through to the scouts and the 2020 point guard has been rewarded for his efforts with a number of scholarship offers from Division I schools, and has some interest from a few others still out there. The offers he has are from Toledo, Wright State, Cleveland State, UT-Martin, Indiana State, Stephen F. Austin, Virginia Commonwealth (VCU), IUPUI, DePaul, Northern Kentucky and Miami (OH). He also has interest from George Washington, Tennessee, Penn, and East Carolina.